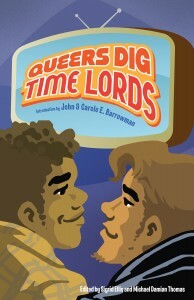 I’m really happy to finally get to post about Queers Dig Time Lords: A Celebration of Doctor Who by the LGBTQ Fans Who Love It, edited by Sigrid Ellis (Chicks Dig Comics) and Michael Damian Thomas (Apex Magazine). It’s being released on June 4, 2013, already seems to have great buzz, and has one of my essays in it. While the stuff I write is always personal on some level, my piece in this volume touches on a lot of things I tend not to talk about in public (yes, those exist) — including being Sicilian, wanting to be a boy, and the age of AIDS — because they’re just too difficult, too close, and too specific in my day-to-day life. 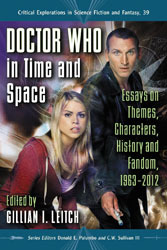 The through time and space nature of the Whoniverse, however, and Jack Harkness’s long-life on 20th century Earth have meant, however, that I couldn’t get away with contributing to this volume without telling my story in ways I’m a lot less practiced at, which is an opportunity I’m incredibly grateful for. I think this volume is going to be incredible. It contains work from a lot of people I know, and a lot of people I know of, and I’m super excited to get my hands on it. You can pre-order it at Amazon and other major booksellers, and it will also be available for early purchase at Wiscon. It’s not even February yet, but there’s no time like the present to start obsessing on my annual trip to Gallifrey One (February 15 – 17, 2013). I’ll be getting in late Wednesday night and probably won’t be consistently close to con until the opening ceremonies on Friday. I’ve got just one panel this year, called “Love and Monsters” (details below) and focusing on the way we often engage with properties we love by talking about how much we hate them. This is, I suspect, slightly apropos after my recent appearance on Fandomspotting as the person who actually likes Glee. Do feel free to say hi if you see me around, even if we haven’t met before. I am always juggling a lot of weird things when I’m out there, so if I need to dash, please don’t take it personally. I’ll be promoting Doctor Who in Time and Space and maybe some other stuff if I’m allowed to discuss those projects by then. As ever ribbons reflecting some particularly terrible in-jokes and rose-flavored macaroons may be on hand if you’re very, very nice.